Jane Austen’s Pride and Prejudice was written in the early 1800s at a time when England was at the height of her power. However, this affects the world in which Elizabeth lives in very little. People in the wealthy middle class cared little for anything but how they appeared to the rest of the world; the Bennetts are primarily concerned with their own futures in their own little worlds and not affected by the revolutionary affairs going on just across the English Channel in France. A woman in the middle or upper class would be required to marry, preferable to a man of higher wealth, as she would be unable to inherit her father’s property. Elizabeth treasures her knowledge and enjoys reading although she would not be required to work. She would have only have been taught the fine arts, writing, reading, and sewing by a governess in her own home. A lack of profession and teaching for women prevented them from becoming self sufficient, which meant that few women could afford to remain single. Most chose to marry instead of depending on family members for financial support. Mrs. Bennett is very concerned for her five daughters to marry as soon as possible, and even an arranged marriage for convenience is better than having an un-married daughter. A man with a fortune would probably have been most in want of a wife, to provide him with both an heir and woman to share his life with. This is in contrast to Mr Darcy who seems to have little care for finding a wife until later in the book when he starts to fall in love with Elizabeth. The soldiers are primarily there for the younger Bennett girls to chase after and Mr Wickham later elopes with Lydia, at only sixteen. This is an outrage to the family and disgraces their name, but Mrs Bennett is pleased that her youngest daughter is married. When a man married, he would receive a little money from the woman's family for taking the daughter, which is the main reason Mr Wickham seduces Lydia, and is disappointed when he finds out that they do not have the money he imagined. Mr Darcy pays him to prevent upset for the family, but mainly to please Elizabeth, and she is one of the only people to find out. When we first meet Mr Darcy at the assembly in Meryton, he is very sour towards Elizabeth. Although he appears to be a handsome man who is liked by many women in the room it is, soon clear that he is arrogant and his manners make him ‘unworthy to be compared with his friend.’ ‘For he was discovered to be proud,’ and nothing can persuade the ladies that he is a suitable partner. He does not endeavour to dance with any of the women or even try to disguise his personality from the patrons at the dance. This shows that although he is very handsome and could easily find any number of partners, he does not try and will happily make himself dislikeable and arrogant which puts ladies off him and prevents any of them from coming over to dance of him. It is shown that Mr Darcy cares little for relationships as he refuses to dance with anyone unless he is already acquainted with them. This is shown thought the quotation ‘I certainly shall not…unless I am particularly acquainted with my partner.’ It is also clear that as well as not caring for relationships the quotation shows that Mr Darcy is a proud man, as he will not attempt to create a new relationship with anyone of the women at the assembly. This links to relationships through the fact that Mr Darcy is alone in life and doesn’t seem to care, where as Mr Bingley would like to get married and is looking for a woman, more specifically Jane. It is also shown that he is proud when he gives his reason for not dancing with any of the women in the room ‘You are dancing with the only handsome girl in the room’. This shows that he thinks very highly of himself as he believes none of the girls are pretty enough to dance with him while his friend Mr Bingley believes that many of them are very beautiful. This shows that he has no beliefs in relationships because he does not attempt to make any acquaintances. He does not think highly of relationships and believes that love is of little importance, and that a relationship must already have been formed before he can dance with a partner. We also know that Mr Darcy is proud as he looks for a partner by appearance, not by personality or skills. He doesn’t look at Elizabeth as she is not pretty enough; “She is tolerable; but not handsome enough to tempt [him]” even though she has a wonderful personality. Her friends can see that she has “a lively, playful disposition, which delighted in any thing ridiculous.” This is shown though after hearing that Mr Darcy does not find her pretty enough she tells the story with great spirit and disguises her discomfort or annoyance with jokes ands delight. 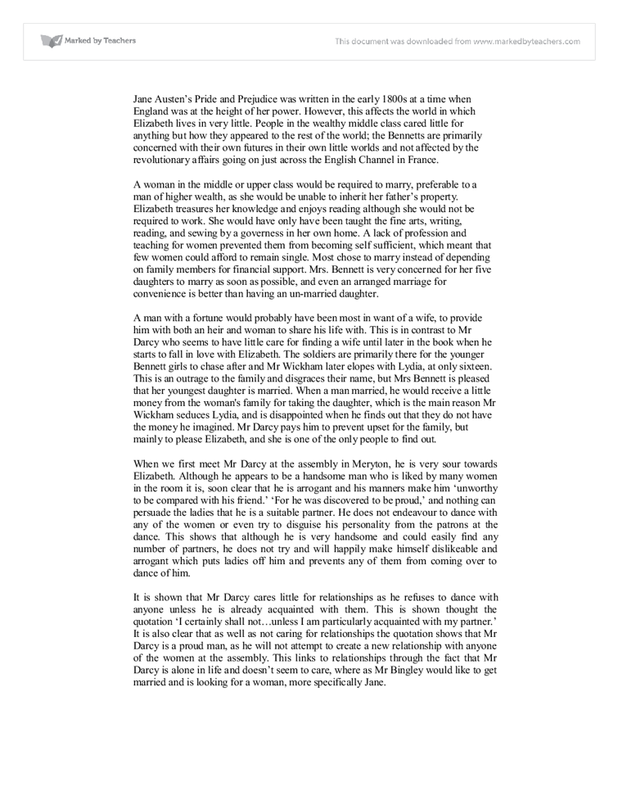 When Mr Darcy first meets Elizabeth at the ball it is clear that he does not think very highly of her as he refuses to dance with her when Mr Bingley offers saying that she is ‘Not handsome enough to tempt me.’ This shows that he takes the appearance of a person in to account a lot and doesn’t really get to know them. He then goes on to tell Mr Bingley that he will not ‘give consequence to young ladies who are slighted by other men.’ This shows that he will not try to create a new acquaintance and will not take a chance on a lady that no other men are dancing with. Although Mr Darcy seems like a very proud man to Elizabeth and her family, he is a very good and loyal friend to Mr Bingley. This is shown when he brings Mr Bingley back to marry Jane after taking him away to London. It is also shown in the way Colonel Fitzwilliam says how Mr Darcy looks out for Mr Bingley ‘Mr Darcy is uncommonly kind to Mr Bingley and takes a prodigious deal of care of him.’ This shows that Mr Darcy does care for people other than himself. It is also shown that he cares for people when Elizabeth finds out that Mr Darcy and Colonel Fitzwilliam are the guardians for his sister Georgiana. ‘Regard for my sisters credit and feelings prevented any public exposure but I wrote to Mr Wickham who left the place immediately’ this shows that he can take care of his sister and is very protective of her. He shows that he cares for Elizabeth when he found her sister Lydia and pays for her wedding. He does this for Lydia because he knows that it means a lot to Elizabeth. During her stay at the Bingley’s while Jane is ill Mr Darcy starts to stare at Elizabeth more as he is in awe of her beauty. Mr Darcy ‘began to feel the danger of paying Elizabeth too much attention’ this shows that he is beginning to fall in love with her as he is thinking about her appearance more than when he first met her at the ball. Although he knows that, he is looking at Elizabeth to much he does not check himself. However, he will not join in with Miss Bingley’s criticism of her, ‘[he] could not …join in their censure of her. On one occasion during her stay, Elizabeth mocks Mr Darcy in an out of character manner, as a young woman in that time would keep her mouth shut. ‘Tease him – laugh at him’ this shows that Elizabeth will speak her mind even if she is out of place. It also reveals that is trying to tease Mr Darcy to try to work out his character and get to know him better. Elizabeth also talks as if she is very proud of her self and because of that; Mr Darcy finds her enchanting and interesting. We know that Mr Darcy likes Elizabeth as he is uncomfortable in the scene as he finds Elizabeth attractive, he does not react very much to her teasing. As Elizabeth is speaking out of place, it makes Mr Darcy uncomfortable. ‘He was as much awake to the novelty of attention in that quarter as Elizabeth herself could be, and unconsciously closed his book.’ shows that he is aware that Caroline Bingley is giving a lot of attention to Elizabeth when she wouldn’t have normally. This also shows that Caroline is trying to get Mr Darcy’s attention and is being nice to Elizabeth when she doesn’t mean it. It also shows that he is uncomfortable with the situation as he starts to do things subconsciously as he is aware that Caroline is watching him. We can also tell from the scene that if the conversation does not include her she will change the subject to suit her ‘Do let us have a little music cried Miss Bingley [who was] tired of a conversation in which she had no share’. It also tells us that Caroline is a very proud person and would always want the attention to be on her. We can tell that Caroline Bingley doesn’t think very much of the Bennet’s as they are in the social class below her and so she can be rude to Elizabeth to try to make Mr Darcy like her better. When she tells Elizabeth that ‘Mr Darcy is not to be laughed at.’ shows that she is trying to make Elizabeth sound wrong and out of place to show Mr Darcy that she does not belong in the same social circle as them. And he shouldn’t fall in love with her. However later when Caroline tries to make Mr Darcy tease Elizabeth, he is uncomfortable and does not want to join in, this shows us that he is already starting to fall for her. Unlike Caroline Bingley Mr Darcy is much friendlier with Elizabeth. ‘And yours…is a wilfully to misunderstand them.’ from this quotation shows that Mr Darcy and Elizabeth are getting on very well as they are teasing each other. It also shows that they are trying to find out as much as they can about each other's character and are doing this by verbal jousting. He also starts to compliment Elizabeth as he becomes more acquainted with her. ‘…vanity is a weakness indeed. But pride – where there is a real superiority of mind, pride will be always under good regulation.’ this is a compliment to Elizabeth as he is saying that Elizabeth is smart for her social class and should take pride in it. This is also showing that he is paying attention to her character as well as her appearance. However he could also be referring to his own pride and saying how his weakness needs to be kept in check, this shows us that he is starting to change his personality and this means that his pride is no longer his most prominent feature. When Elizabeth finally agrees to marry Mr Darcy, we can see how he has changed. Mr Darcy begins by listening to what Elizabeth has to say, and then by apologizing with true feeling and emotion; ""I am sorry, exceedingly sorry,'' [he replied] in a tone of surprise and emotion." This tells us that he is no longer too proud to love Elizabeth, or too accept that he has made a mistake. This shows us that he has become much kinder and more thoughtful than before. We know that this pleases Elizabeth, as she is too embarrassed to try to argue with him or to say a word. He is also only thinking about what Elizabeth thinks of him as long as she loves him, he is happy; "I thought only of you." Through this, we can also see that he is no longer proud, but it also tells us that he respects Elizabeth's feelings. He asks her whether, "If [her] feelings are still what they were last April…" to tell him, for his are still the same but "one word from [her] will silence [him] on this subject forever." When she tells him that her feelings have undergone a radical change, "the expression of heartfelt delight" that covers his face and "The happiness, which this reply produced, was such as he had probably never felt before," and he expresses himself in a more delighted way but without embarrassing himself or Elizabeth. Mr Darcy is much more open to Elizabeth as he shares his feelings with her, which is in extreme contrast the other two scenes where he will barely talk to her, let alone share his feelings. He lets Elizabeth know how he feels and when she understands this, his affections become more and more precious to her, "he told her of feelings, which… made his affection every moment more valuable." We know that he is aloof and thinks that all women are below him in the first scene, but in this scene, he puts Elizabeth on an equal level to himself, in both asking for her opinion and also by letting her know how he feels about her with respectful words, "My affections and wishes." This shows us that his pride toward her has gone and now he can love her for her personality, not only her appearance. He tells Elizabeth that she has been a great influence on his life and that he learnt from her, as well as having feelings in his heart "It taught me to hope…as I had scarcely ever allowed myself to hope before." This shows us that he can talk to her and tell her about his feelings without being ashamed of himself, showing his pride is no longer affecting his love. Mr Darcy tells Elizabeth how he knows her well enough to know that she would have openly told Lady Catherine if she had no intention of ever marrying him, "I knew enough of your disposition to be certain that, had you been absolutely, irrevocably decided against me, you would have acknowledged it to Lady Catherine, frankly and openly." Mr Darcy shows that he already knows Elizabeth well enough to have the hope that she will not reject him a second time. He acknowledges that he is a bad person, also showing that his pride no longer affects how he thinks of Elizabeth, "What did you say of me, that I did not deserve?" He also notes that he is glad that she had no second thoughts on rebuking him, "My behaviour to you at the time had merited the severest reproof… Your reproof, so well applied." This shows us that he no longer has the nerve to look down on women and that he looks us to Elizabeth for her strength. In Pride and Prejudice the relationships between Mr Darcy and other characters especially Elizabeth Bennet are complex and develop throughout the book. When they first meet, Mr Darcy does not like Elizabeth and thinks only of his pride and superiority of her social class. During the book he discovers that his feelings towards Elizabeth are, becoming more and more pronounced until he discovers that he actually loves her. Although they are in different social classes and his friends do not approves he proposes to her but in an unromantic way. He then discovers that his feelings are stronger than he thought and when he helps to get her family out of disgrace, they mutually agree to marry. 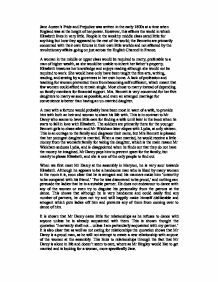 This student written piece of work is one of many that can be found in our GCSE Jane Austen section. Why Is Mr Darcy a suitable partner for Elizabeth in &amp;quot;Pride and Prejudice&amp;quot;? Discuss Elizabeth Bennett's superiority in the novel 'Pride And Prejudice'. How do Darcy and Elizabeth Change and Develop in Pride and Prejudice? The women in the early nineteenth century wore tight fitted gowns. Women's cloths at this period were not, as a rule, brought ready made. The women were well mannered to their husbands and others. As you can see in the film Elizabeth was really a pretty object with her dress so uniformly white and orderly. It could be said that Lydia's elopement brought them together as Mr Darcy has finally found something that he can do for Elizabeth. Jane Austen has used the negative features, such as naivety in Lydia's case, of one character to bring together two others. Because of this, Elizabeth has built a very strong character in assuming the responsibilities as both a mother and a father to both her children. A clear similarity in both stories is that they feature a 'strong' female character. For instance, Elizabeth, though pregnant, would go out in the dark night to look for her husband. Miss Binlgley and Mrs Hurst find this astonishing: 'that she should have walked three miles so early in the day, in such dirty weather, and by herself, was almost incredible to Mrs Hurst and Miss Bingley.' Her general wit in conversation is very subtle and Jane Austen mocks characters of society through Elizabeth mocking the characters in the novel. been bordering upon rudeness, as well as against etiquette, which states that women should be refined and orderly at all times. This surprising outburst would have made Mrs. Bennet look not only foolish and impolite, but would have damaged the Bennet's reputation as well.